What are smart goals? S is for significant or specific to me. M is for meaningful/ measurable. A is for action/attainable. R is for rewarding and relevant to me. T is for time related/track-able. 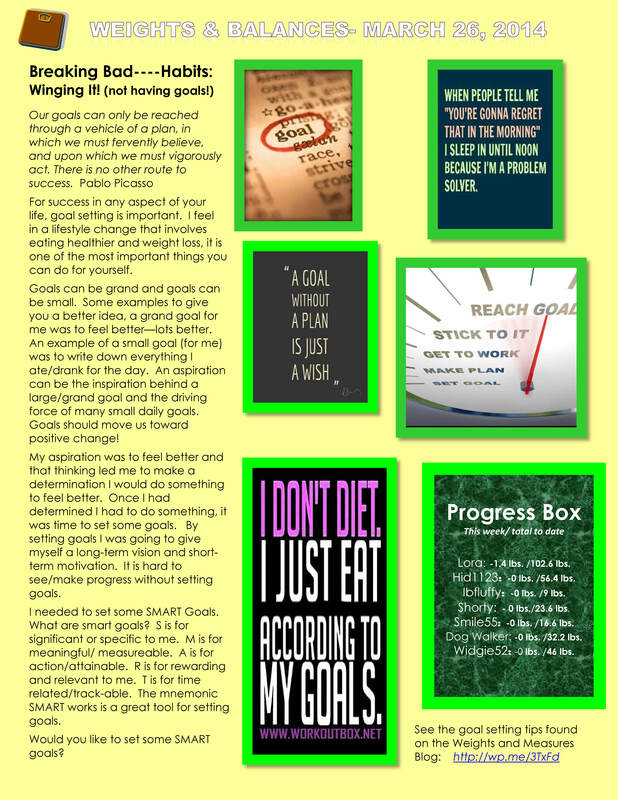 The mnemonic SMART works is a great tool for setting goals. Write them down. This seems to be obvious, but many do not write down their goals. Make a “to do” list to obtain your goals. These are the steps you must do to obtain your goal. Often people forget to do this! They would like to lose 25 lbs but do not write down things they have to do to achieve this goal! Each goal should be stated in a positive manner. For example; eat more fruits and vegetables instead of don’t eat chocolate for the rest of my life. Be realistic. Goals must be achievable and not unrealistic. Set goals that motivate you. (i.e., they are very important to you!) Think about why this is important to you, write it down! Make small achievable goals. For example, I want to eat at least one piece of fruit today. I want to walk an extra five minutes today. etc. Commit to your goals. Understand that accomplishing all goals are not done overnight. It takes time! Be precise. Such as, I want to lose 5 pounds this month instead of I want to lose some weight. Reward yourself when you accomplish a goal appropriately. For bigger and more significant goals the bigger the rewards! Be flexible. If you find something that changes how you view your goals and you need to change them a bit, do it! Set a time frame to achieve. This one can be your best friend if you are realistic or your worst nightmare if you are unrealistic. For example, I want to get in better shape this year vs. I want to lose 50 lbs by April of this year (it is already March!). Stick with it! Don’t give up! Give yourself reminders to stay on track! Your community, co-workers, friends and family can be great supports when you need it. Track your achievements. Check off your goals as you accomplish them. Make your goal public. This does not mean you have to post it on Facebook or have it printed in the evening paper. It might mean finding a person who is interested in your efforts and can help cheer you on as you strive to reach your goals. Setting goals and writing down steps to achieve those goals is one of the best ways to keep focused on your weight loss journey. I thought it was time I gave you a personal progress update. When I set out in January 2013 to become healthier by joining Weight Watchers Online, I knew what to do but didn’t know how long it would take me to reach those goals. Last week, I reached a major milestone in my weight loss journey. I have now lost over 100 lbs!!! Yay me! For the first time since I began, I can now look at the end goal any not only the five pounds at a time mini-goals. I know as of last Wednesday, I have 20 lbs to reach my goal BUT my focus is still on the next five pounds mini-goal to reach 105 lbs lost. My focus since last Wednesday has been to lose the next 3.8 lbs. That will probably take 2-3 weeks depending on my body’s reaction to several things over the next few weeks. I will be starting to attend Weight Watcher’s meetings locally this week. That will be different for me and I am sure their scale will give me a different reading than my scale at home. 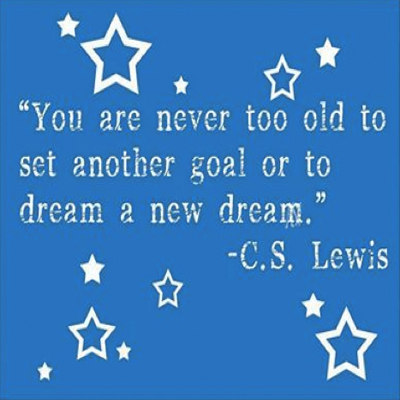 So I am sure I will be “up” when I officially weigh in, but I know I am still headed in the right direction! Thank you for reading and sending your comments and words of encouragement! Here is an updated progress photo. I am getting closer to my end goal! Many people look at me and do not believe I have twenty more pounds more to lose, but if they could see my “doughy” middle they would agree, that from the “middle” alone, easy 20 lbs! I am trying to pamper my skin. I am hoping that time will heal some of the “self inflected” scars of being overweight will start to heal. I know I am not in my 20’s and I am seeing things I never saw happen to my body back then. If I would pass along any words of advice it would be to those in their 20’s and 30’s get rid of the weight now because your body loses its ability to “bounce back” that it might now have! 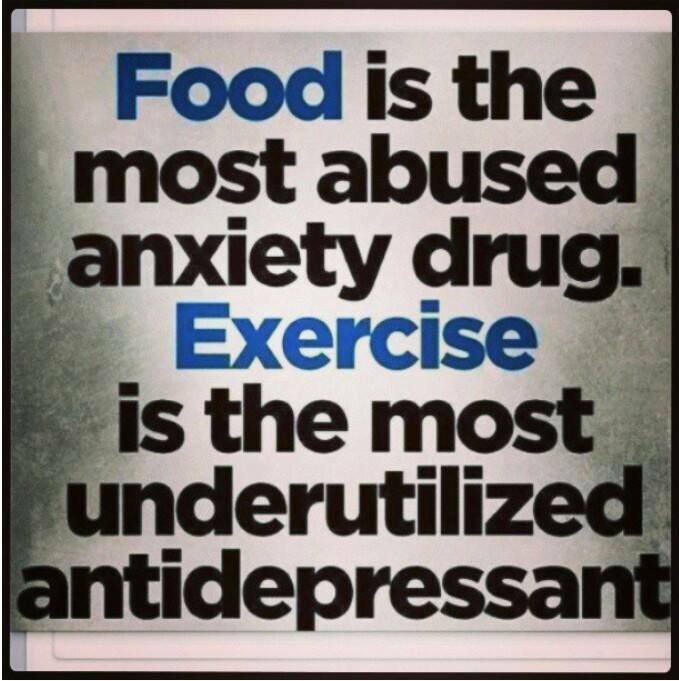 Be smart get fit now! Don’t put it off! Bat wings, doughy middles and prune like skin are no fun to deal with!! It isn’t pretty to look at either but I would rather be a healthy weight and have those lumps, bumps, sags and wrinkles than to be overweight and unhealthy! 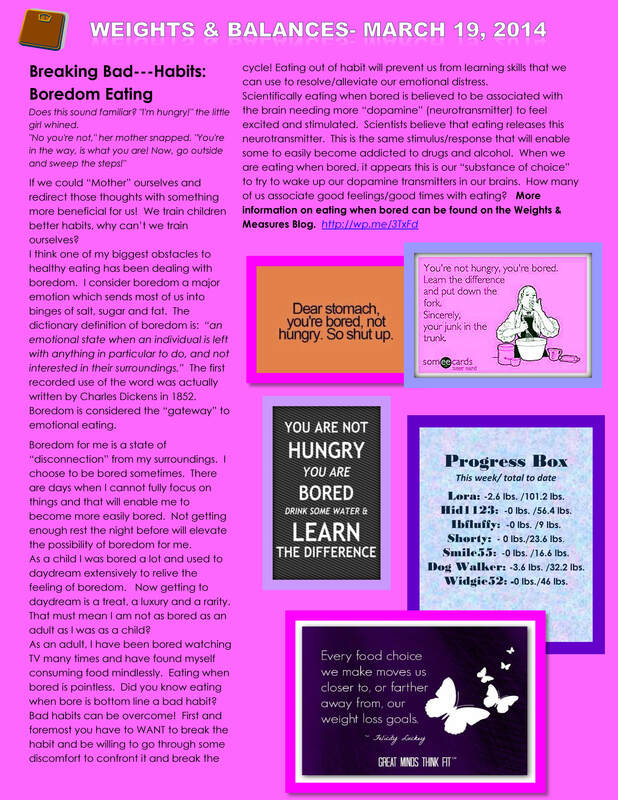 This is a continuation of the article from the March 19th Weights and Balances Newsletter. Scientifically speaking, eating when bored is believed to be associated with the brain needing more “dopamine” (neuro-transmitter) to feel excited and stimulated. Scientist believes that eating releases this neurotransmitter. This is the same stimulus/response that will enable some to easily become addicted to drugs and alcohol. When we are eating when bored, it appears this is our “substance of choice” to try to wake up our dopamine transmitters in our brains. How many of us associate good feelings/good times with eating? Don’t start eating just because everyone else is eating! Being tired can often lead to overeating; don’t eat at midnight; just go to bed! What can I do to instead of eating when I get bored? Keeping a food journal – write down what you are feeling before you eat, are you really hungry or thirsty, keep dates and times when you feel “driven” to eat too, rate your feeling of hunger from one to ten! Become familiar with what triggers you to eat (patterns) and set up a plan ahead of time on how to deal with it in more productive way! 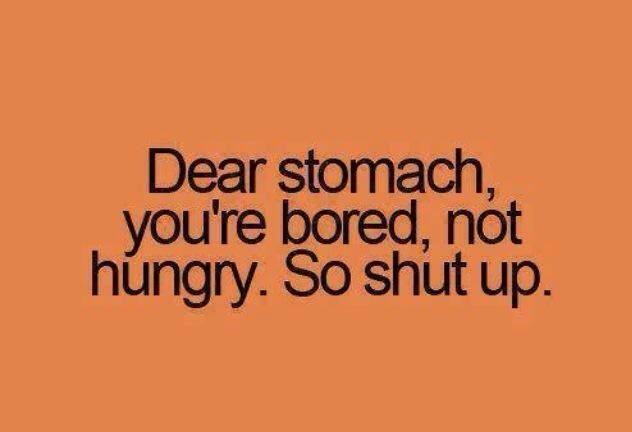 I think the point is do ANYTHING productive but eat when you are bored! I have begun to try ask myself the following when I find myself driven to eat when I am not really hungry. I ask myself, why do I want to eat now? What do I want to eat right now? Do I want something specific? Do I want something salty? I have found myself also asking after starting to eat something I really wanted, how much am I enjoying this? Don’t beat yourself up; move on! 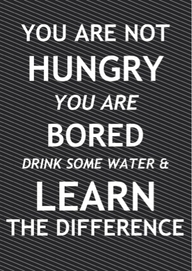 It is hard to face that you have some bad habits; but eating out of boredom is that. Time to overcome! Time to make more positive changes! This is the first in a series on breaking bad habits when trying to lose weight. At one time or another we have all over eaten. But there are other levels for overeating that can cause long-term health issues. Dr. Daniel Amen is a world-renown neuropsychiatrist who has devoted his career to researching over-eaters and why we do it to ourselves. 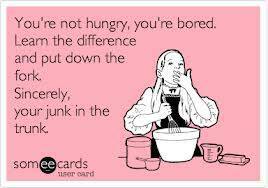 The basis for over-eating can be a symptom of a much larger problem that we are not resolving in a productive manner. To determine what is the cause of our over-eating we have to look deep within ourselves and be prepared to face what might not be some not so pretty things about ourselves. Some are very self-aware and can do this soul-searching on their own but many of us need the guidance of someone who is trained to deal with these issues. Are there effective strategies for overcoming overeating? Here is a short list of some strategies which through his research Dr. Amen has discovered to work for over-eaters. This is general information which I hope to explore further in the future. Knowledge is power and if we can recognize certain issues we have with overeating within ourselves then we can begin to use effective strategies to overcome our overeating.